*Dilly Dolls*: It's hunt time again! 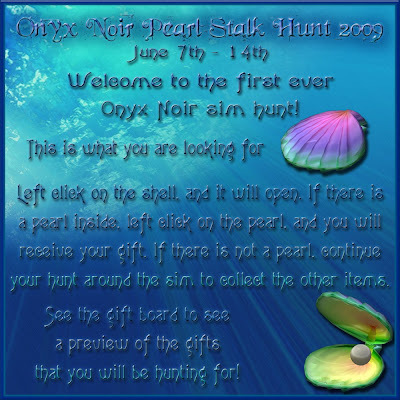 This is officially the very first ever Onyx Noir Full Sim Hunt! There are 6 stores, as well as GL Designs and *DD* participating in this hunt. Our theme this time around is "summer". And what is one thing that is fun to do in the summer? Well I don't know about you, but I used to enjoy collecting shells. I have never been lucky enough to find one with a pearl inside, but maybe you will! That's right, you will be hunting for pearls! You need to stalk around the sim looking for the oyster shells. Once you find one, left click on it. When it opens, if it is empty, move on. If you find a pearl inside, click on it to receive your gift! There are at least 14 different prized in pearl shells around the sim, and the hunt is a week long, so take your time!